Sheer butternut squash rounds over burrata make a voluptuous bit. Nibble a natrutium leaf. Here’s a first for me: I’m ordering seconds on satiny sunchokes with hazelnut and black trumpet mushrooms because I’ve put away more than my share of the dish’s intoxicating, molten cream. My pals second my bid for seconds. No, I’ve definitely not converted to Michael Pollan globe-saving: “Eat food. Not too much. Mostly plants.” But as chefs are more drawn to fussing around with vegetables, so am I. The dining room is small and beige with lamp shades hanging low over many bare tables. Chef Andrew Carmellini and his partners from The Dutch, Lafayette, and Locanda Verde don’t seem to be selling Little Park, their latest gambit in Tribeca’s Smyth Hotel, as vegetable-forward or gently priced, but in fact, it’s both. When my brain settles down to focus on the modest number of choices here, it’s the roots and bulbs and creepers I’m longing to try. 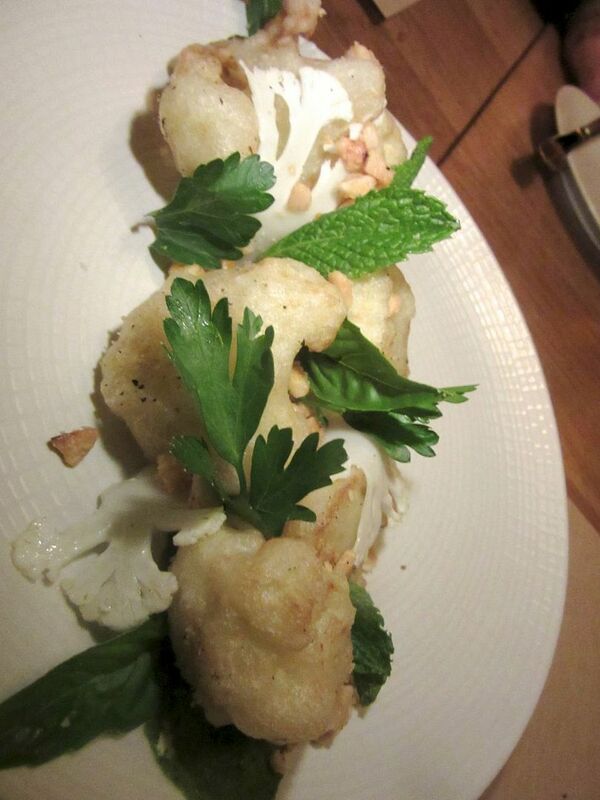 Cauliflower, a gift from the kitchen, is battered and fried, served with pistachio and Italian parsley. 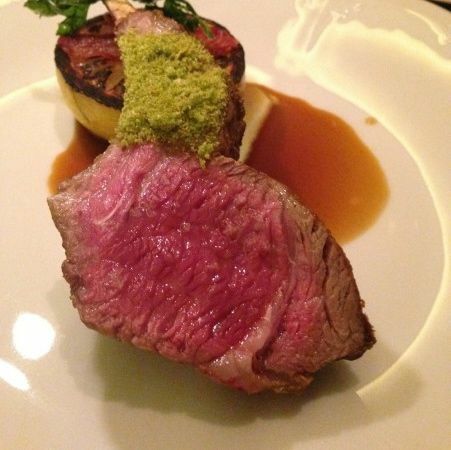 And if you don’t succumb to every new trophy of the farmer’s market and too many expensive cocktails from the Evening Bar – gin with beet powder, scotch with porcini vinegar -- you might get out for $65. But if you’re curious like us, seduced by plates in all categories, mostly $13 to $19, and committed to sweets at the end, forget about thrift. I could not have imagined that beet tartare could be so seductive, here with horseradish cream and rye crumbs. 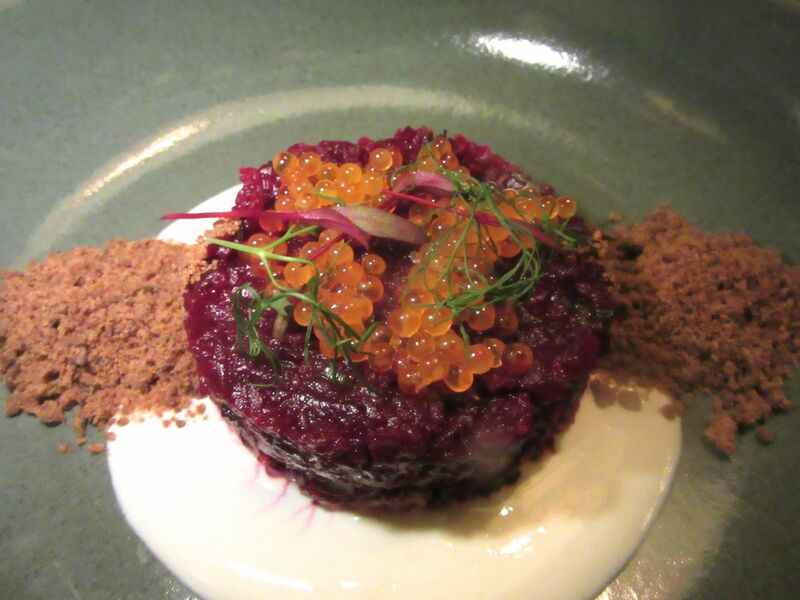 Believe me when I testify that the beet root tartare, blended with horseradish cream and rye crumble, beneath a salty crown of smoked trout roe, is the hit of our first dinner -- more thrilling than the whole wheat spaghetti with pork and cabbage. 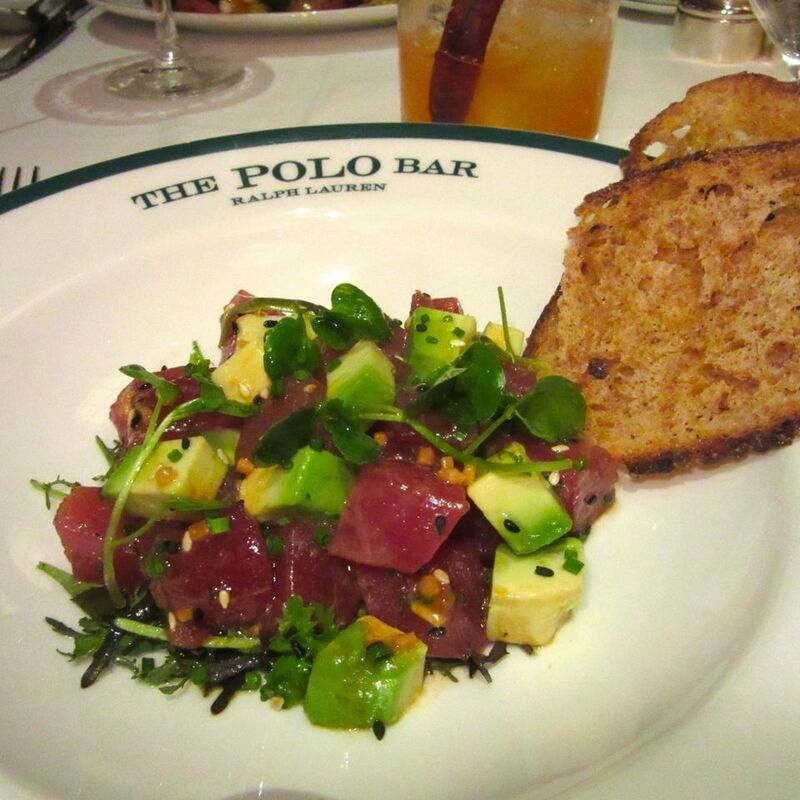 We pile the ruby tartare on “spent grain bread,” parsimoniously “served upon request.” It’s made with the grain leavings of the house’s Greenporter custom made ale. We boldly solicit a refill. Our just-hatched server seems awed by our audacity. It takes a while – are they baking a new batch? 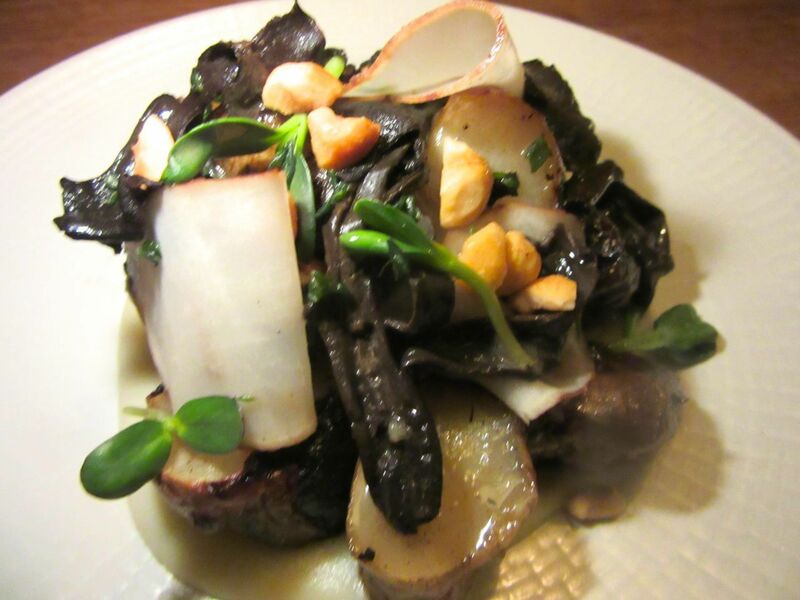 Sunchokes and black trumpet mushroom tossed with hazelnuts on a creamy puree are thrilling. Sheer, almost see-through slices of butternut squash atop burrata with nasturtium leaves strewn about is a voluptuous little bite, more eye candy than sustenance, and the celery root pastrami with pickles is a bit of a hodgepodge. Somehow we’ve overlooked the $18 heirloom carrots with crumb brûlée and black garlic. 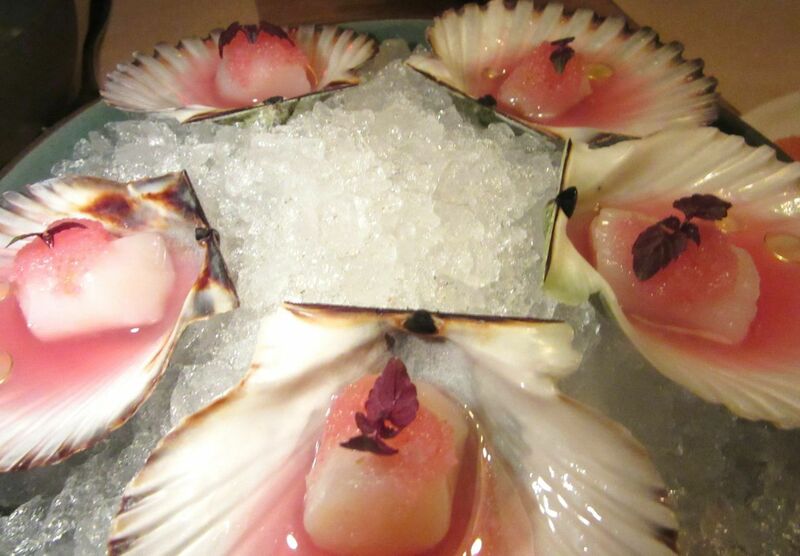 Small peconic bay scallops in a pool of apple cider come in the shell on ice. We’ve already explored small raw scallops still in the shell, sipped their cider pools and done our usual full swoon over Santa Barbara uni. Given the passion, the waiting, a sample of the ale and too much bread, it seems like we’ve been in this corner forever. 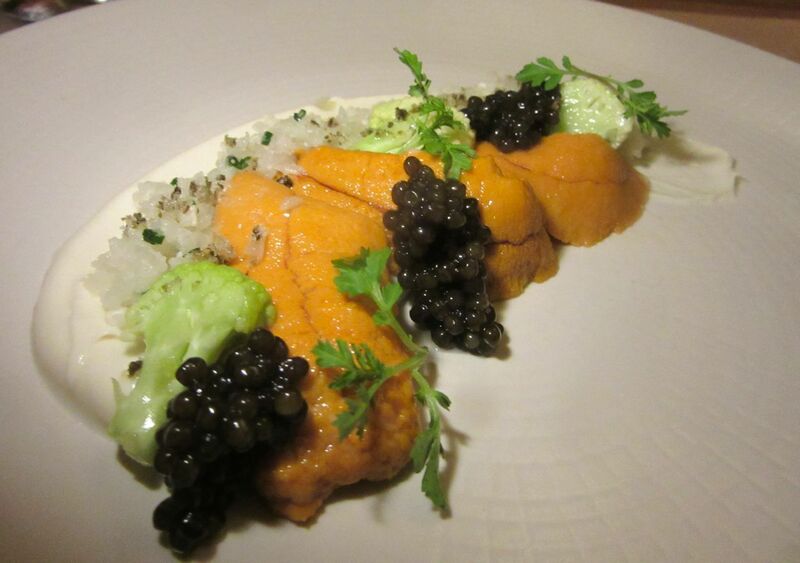 A luscious chorus line of sea urchin with bits of cauliflower is topped with caviar. 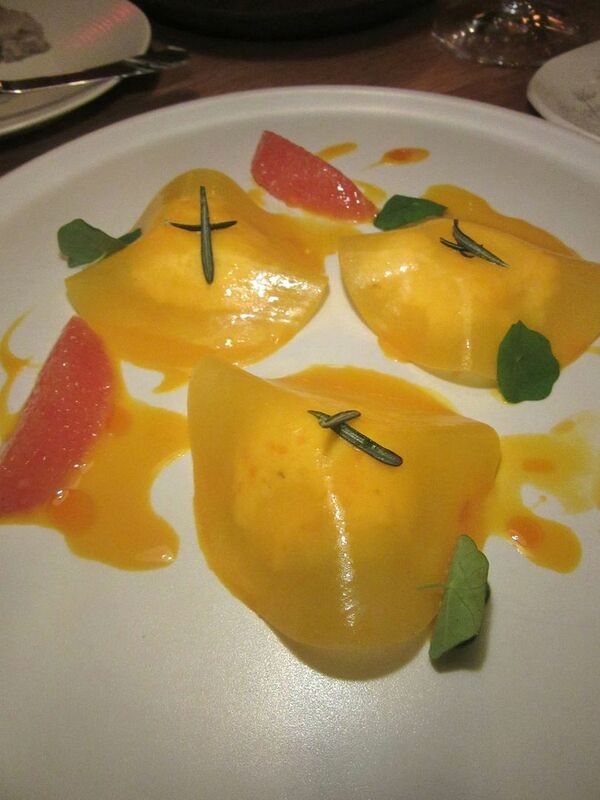 Vegetable posturing -- that I found amusing at Narcissa, compelling at Via Carota, irresistible at ABC Kitchen and imperative at Stella-- has become impossible to ignore. Nor would I want to -- especially here, where Carmellini, who can be rigid and academic about his growing ambition, seems pleasantly relaxed. He’s not committed to being French or Italian or early American. I get the sense he strolled into the kitchen, surveyed the market delivery, and put together dishes that simply please him. 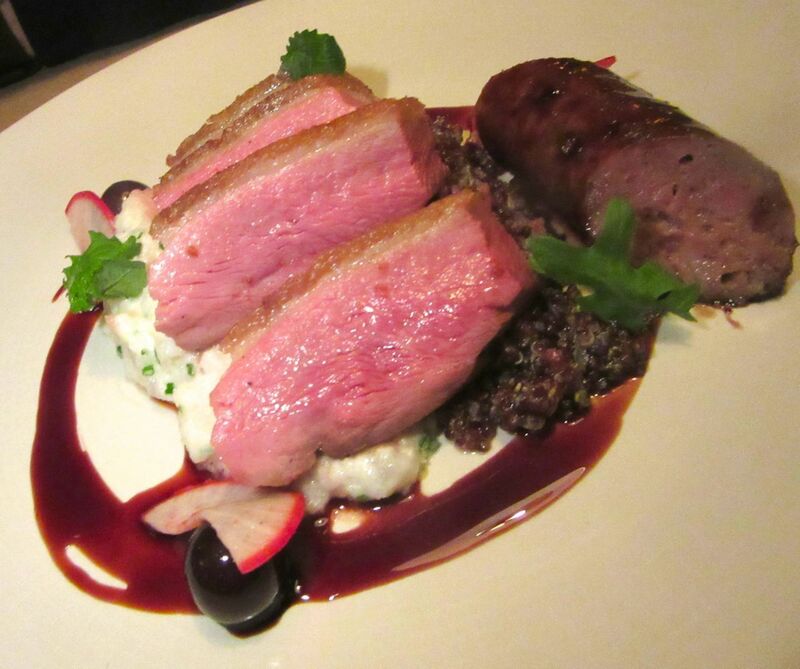 Just enough rose pink slices of duck breast on turnip salad with duck kebab, at only $19. Under fire-roasted meats there are only three items – rose-pink slices of duck breast with a duck sausage and turnip salad, the grass fed hanger with charred broccoli and spatchcock chicken with local green wheat (freekeh, the menu says). 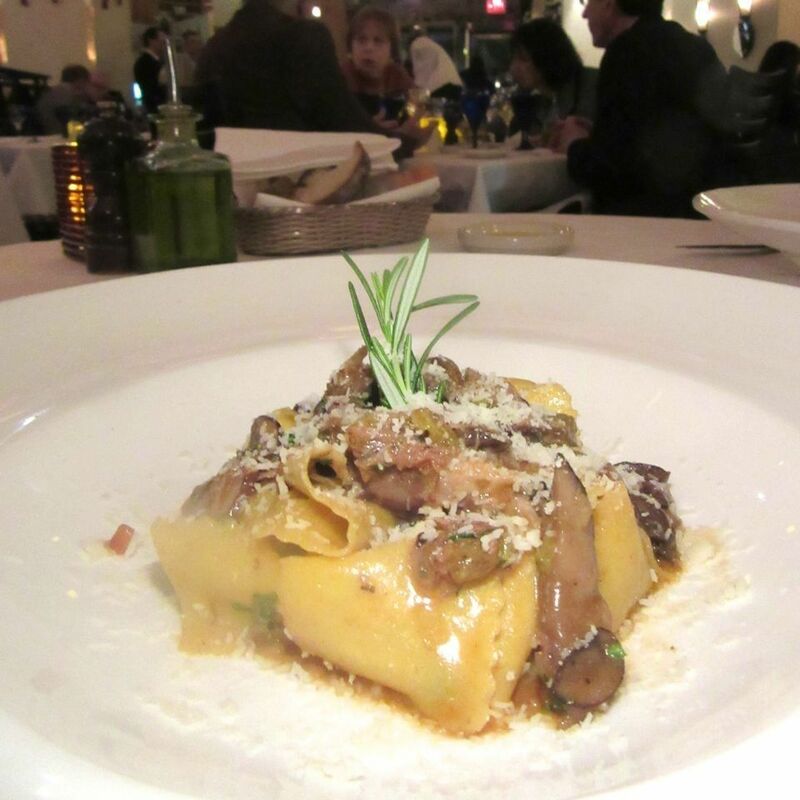 In two visits, we’ll taste them all and the $15 spicy shellfish ragu, which is not remarkable. 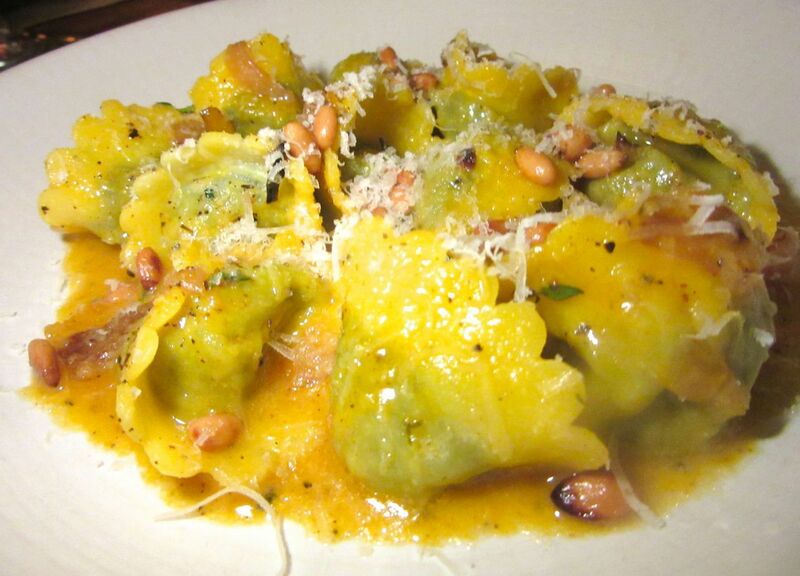 Kale fans must have their kale, here in squash ravioli with pine nuts. We’ll pass around the plump little black kale ravioli with squash and pine nuts because there is always someone who has to have kale these days. And we’ll all tuck into the spatchcock chicken set off by a swirl of squash puree, because we still have faith in chicken, and most of my pals can’t even quote Michael Pollan. 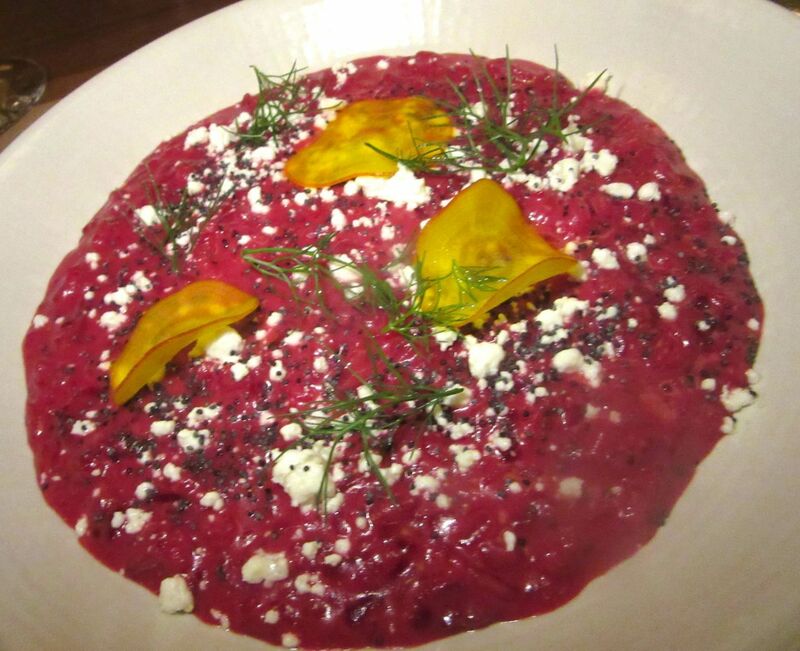 But the cheese-laced beet risotto is the real triumph. Tangy cheese salts this intense beet risotto with poppy seeds. 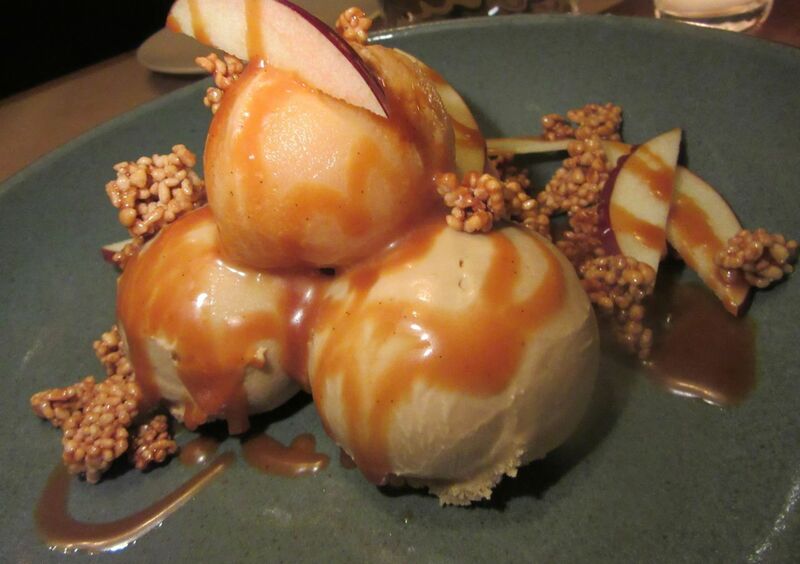 Pastry chef Jennifer Luks lush caramelized apple on apple and beer ice cream sundae with brittle. I never found time to get downtown for lunch. The Little Park team does breakfast and room service too. Expect spelt pancakes, fresh pressed kale spinach smoothie with cucumber and green apple, and a celery root cutlet sandwich. 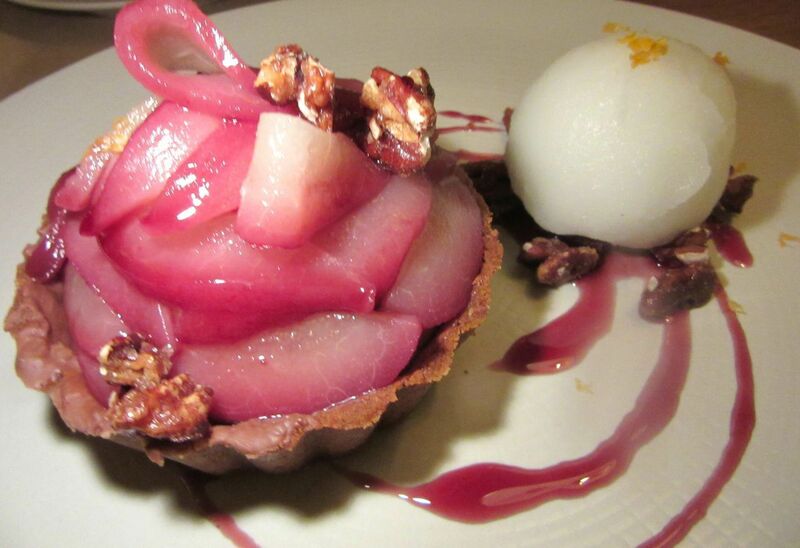 Chunks of winter pear in milk chocolate tart with white wine sorbet. 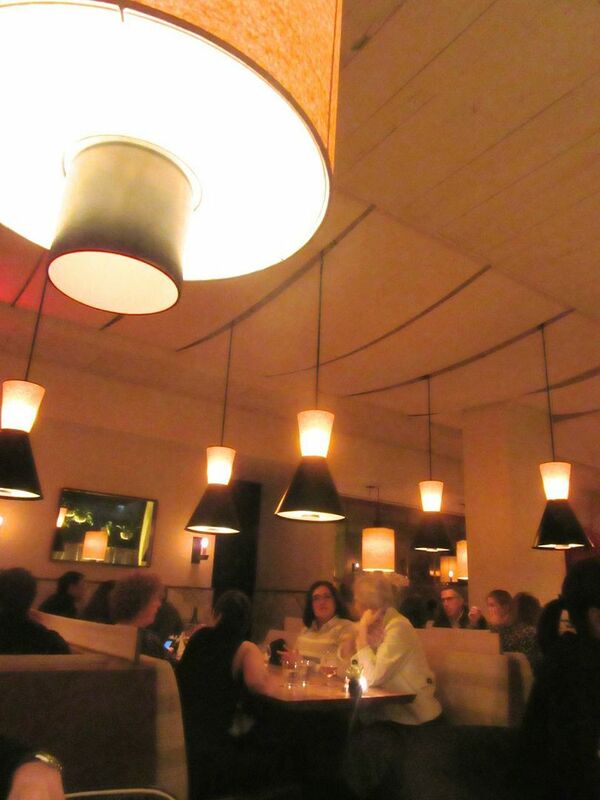 The dining room is small and very beige with big lampshades suspended over most tables. Hanging air plants in the bar say someone at least tried. At an appointed disco hour the lights dim, the music revs up. Someone stands up to leave and bangs his hand on the low-hanging shade. If he’s butch, he’ll pretend it doesn’t hurt. If you’re lucky, your waiter might remind you to duck before you get walloped too. 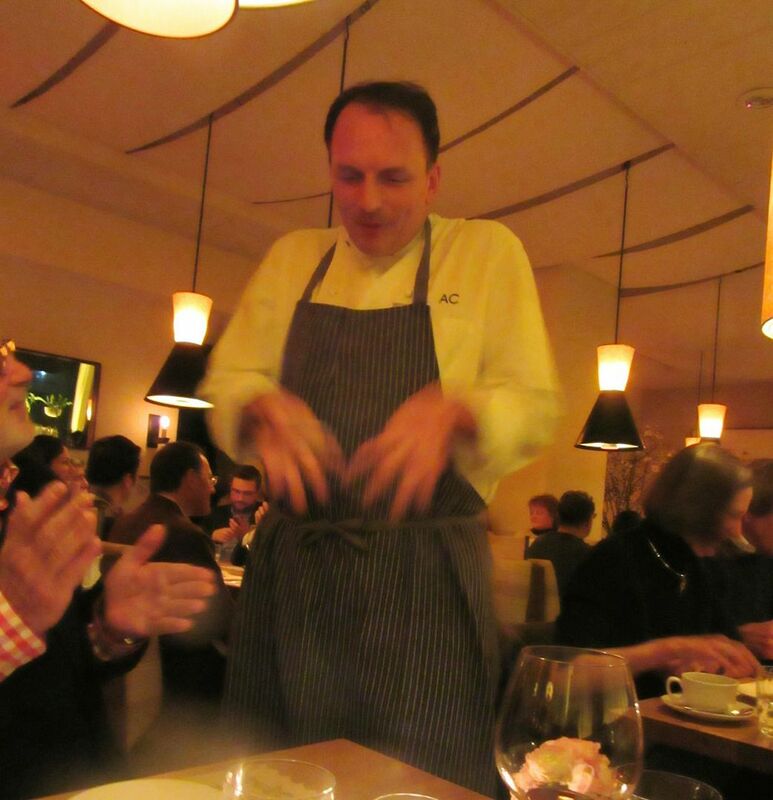 Chef Carmellini seems shy as he emerges from the kitchen for applause and compliments. 85 West Broadway on the SE corner of Chambers. 212 220 4110. Breakfast Monday through Friday 7 to 11am. Saturday and Sunday 7 to 10 am. Lunch Monday through Friday 11:30 to 3 pm. Brunch Saturday and Sunday 10 am to 3 pm. Dinner 5:30 to 11 pm.